Hello to all on this busy, busy Monday. Hope you had a brilliant weekend! I'm just now catching a breath of a moment to share my pics from yesterday with you. 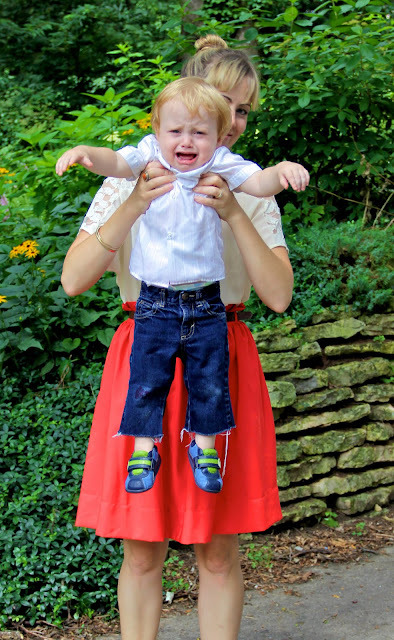 We stole a quick few shots in our Sunday best but as you'll notice, little E wasn't having it. Pity ... he looked so cute in his vintage button up and cut offs. 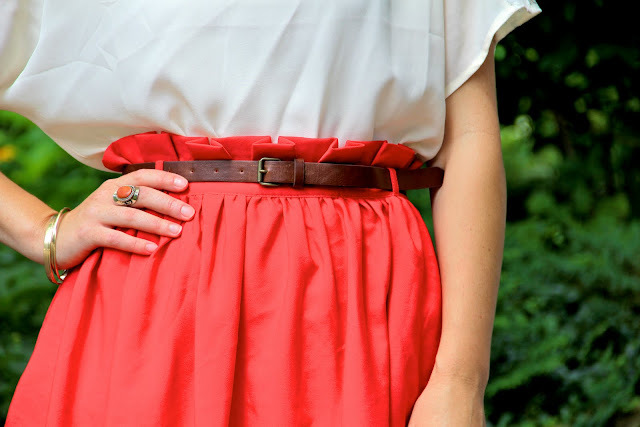 This is the second time I've photographed this skirt for you (and in one month! - must be love) and here is the first time my skirt and I sashayed about town. For my second, we dressed up a bit more. Though I love pretty nails, I rarely have mine painted (as you can see below). It's awful ... they should be ... especially for a close up pic. But I have horrible nails that chip and break an hour after their glossy coat is sloshed on. So that's why my hands are so plain jane, just about always. It's a lovely twirling skirt ... always something you should test out in the dressing room before you purchase.